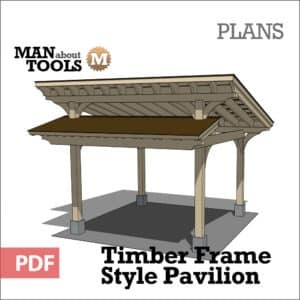 Build your own Three Gable Timber Frame Pavilion. 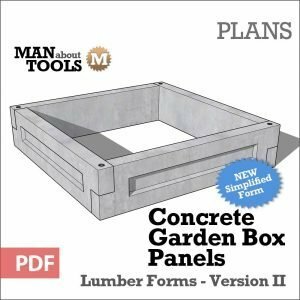 Plans available for download in PDF Format. 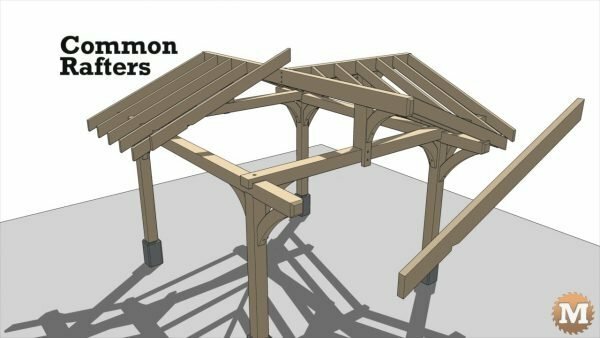 My good friend Connor and his wife Sara asked me to help them build a pavilion in their back yard. 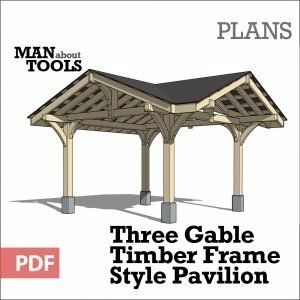 They wanted a timber frame three gable structure so I modeled up a design in Sketchup and drew up some plans. 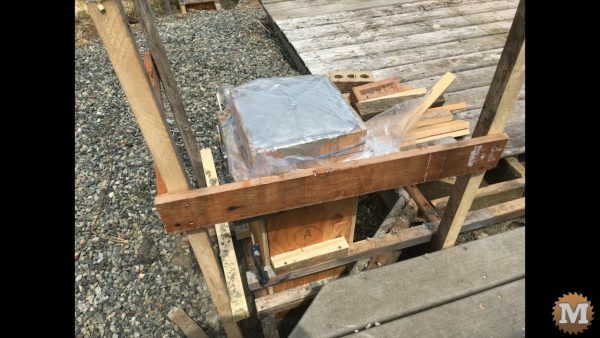 The posts will sit on formed concrete piers. There’s two beams running North to South. And two beams running East to West. 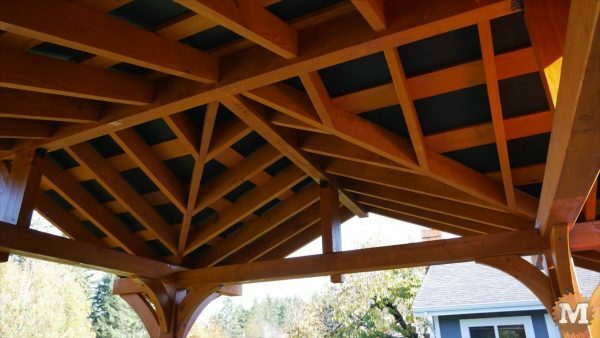 Corner braces add rigidity to the frame at the intersection of the beams and posts. 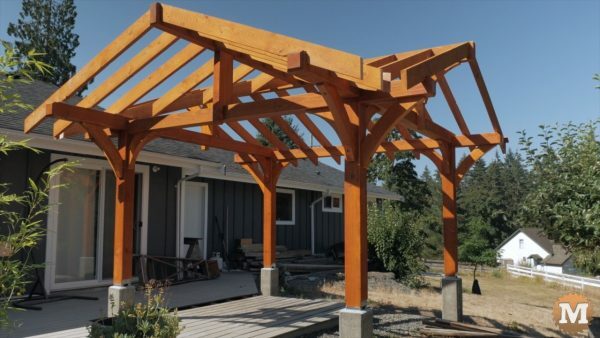 King posts sit mid span on the beams and support the upper ridge beams. Valley rafters run from the peak to the corners and support the jack rafters. 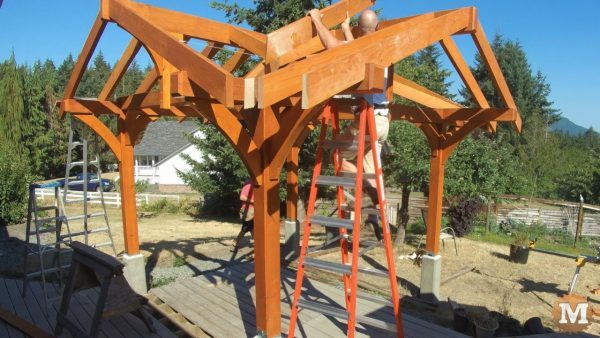 Common rafters finish the gable ends and the West facing roof slope. 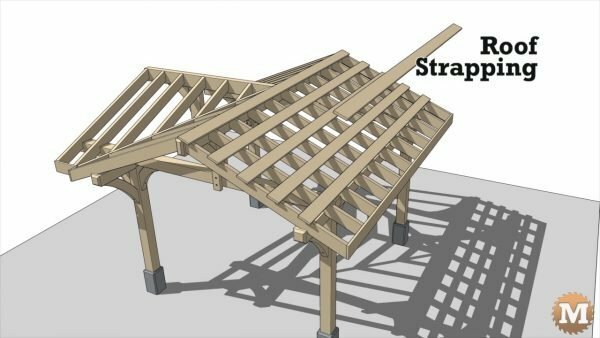 Strapping is laid over these rafters and over the jack rafters on the Northeast and Southeast corners. The roof is finished with plywood then metal sheet. 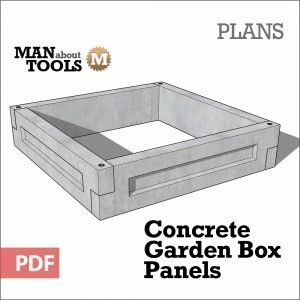 I have a full set of plans available for download. 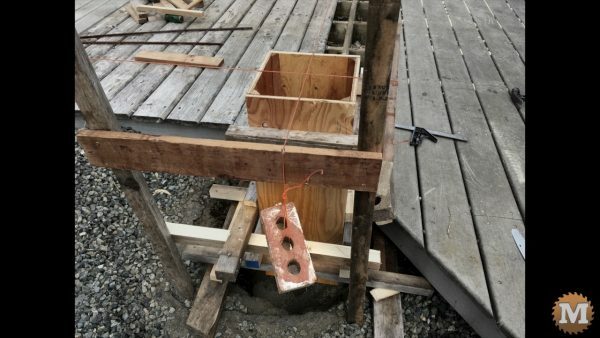 We cut into Connor’s deck and built batter boards to lay out the footings and concrete piers to support the structure. 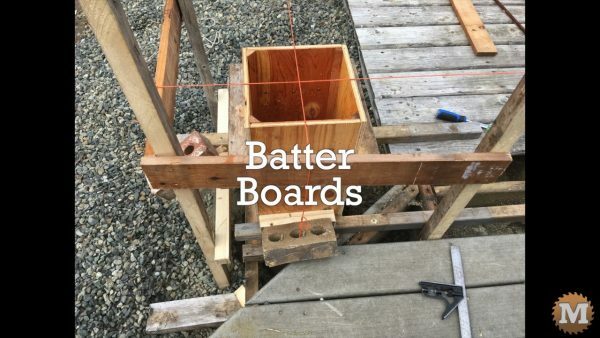 I used string drawn over the ledger boards to locate the center of each post. The strings are kept taught with bricks. They can easily be adjusted or pulled out of the way if needed. The string lines are squared so the posts are 10′ x 10′ on center. I leveled the tops of all the forms so they would be on the same plane. I used a laser level to help with this. 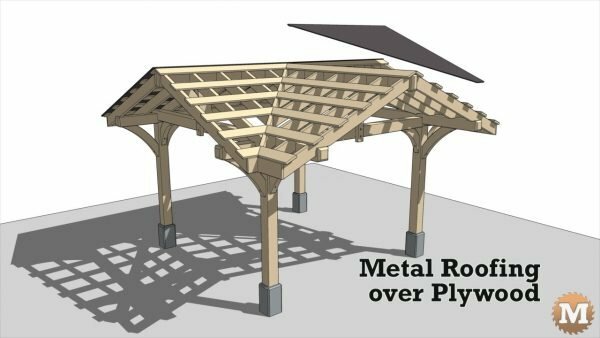 The pavilion is made from Douglas Fir rough sawn from a local mill. 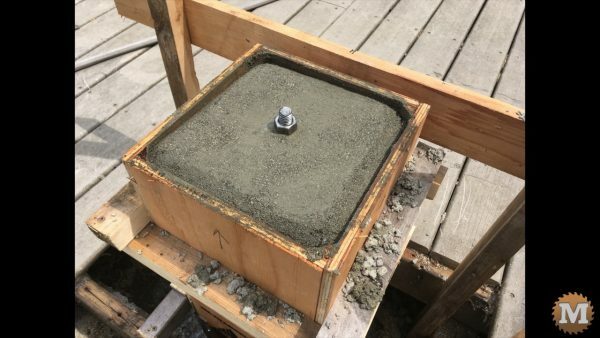 The posts sit on adjustable galvanized saddles attached to an anchor bolt embedded in the concrete. 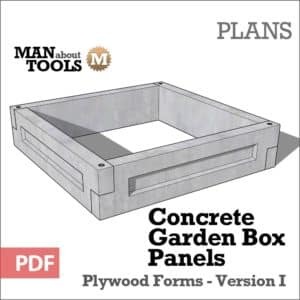 The plywood forms are coated on the inside with vegetable oil then concrete poured in. They are covered with plastic and left to cure for several days. The screws are then removed and the forms stripped. I shot time lapse for most of this build. The posts are cut to length then screwed to the saddles, plumbed, and held in place with temporary braces. 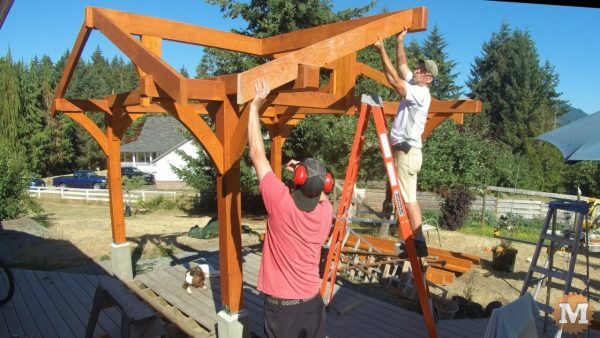 The four 6×6 beams are laid on sawhorses while I check the spacing of the posts with a tape measure. 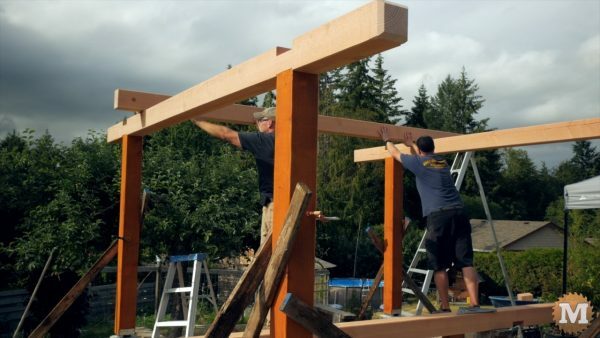 I also double check that they are plumb before I lay out and cut the first beams. 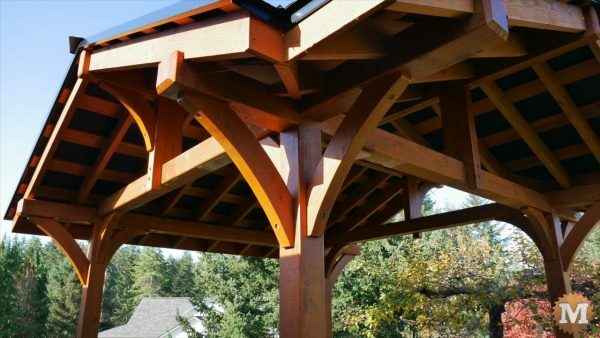 The North/South set of beams have a 45 degree chamfer on each end and two opposing grooves. 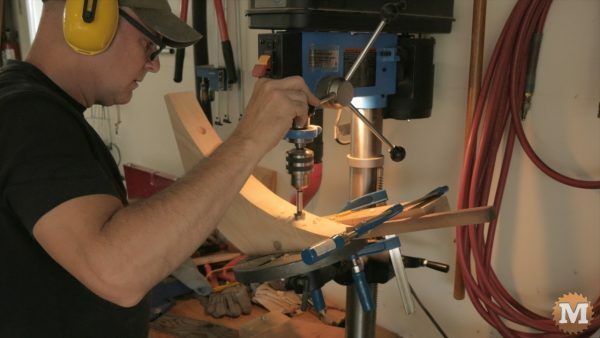 The upper groove is 2″ deep and the lower groove that sits on the post top is a half inch deep. 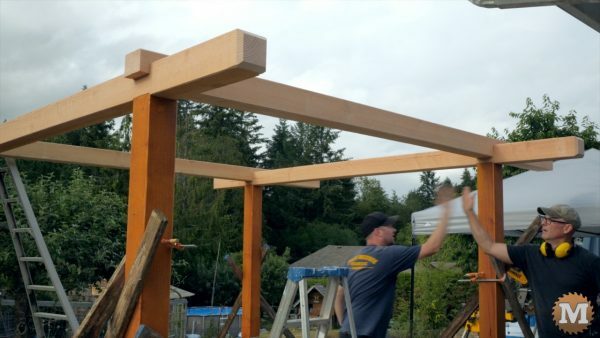 With the posts in their final position, I cut the North/South beams to length with a circular saw. 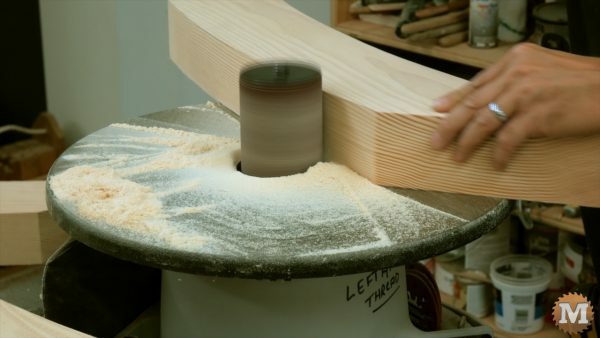 Next I lay out the upper 2″ groove and Connor makes a series of thin slices into the beam with a circular saw. These are then broken off with a hammer then the groove (or lap) is cleaned up with a chisel. I lay out and cut the shallower groove on the opposite side of the beam in the same fashion as the first grooves. 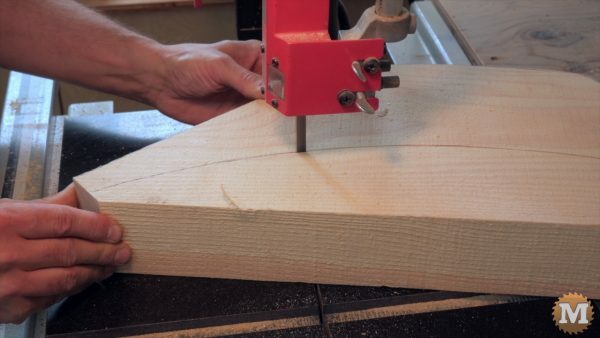 These four grooves are then cut into the other beam. 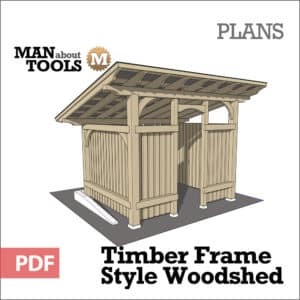 The chamfers in the ends of the beams are cut with a circular saw set at a 45 degree angle. A large square is used as a guide. 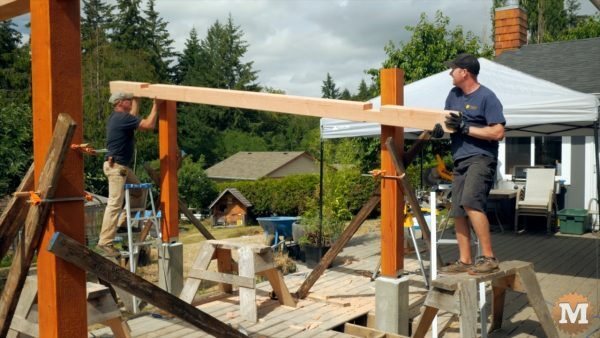 The first beam was lifted into place but the groove on my end was too tight, so we brought it back down and trimmed it a bit. And we tried it again and this time it fit. A few screws will hold the beam in place for now. 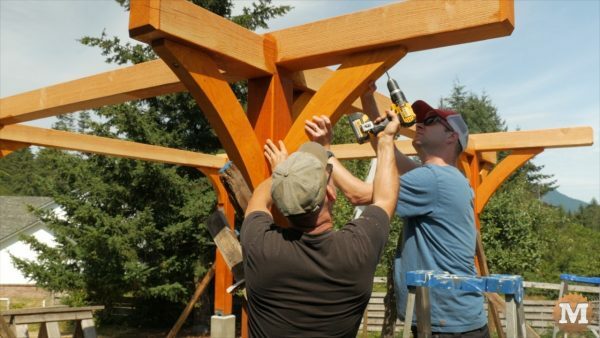 The chamfers are cut on the ends of the next beam and it’s lifted into place. The East/West beams have 2″ deep laps that are open on the West end. On the other end, grooves will fit tightly over the North/South beams. 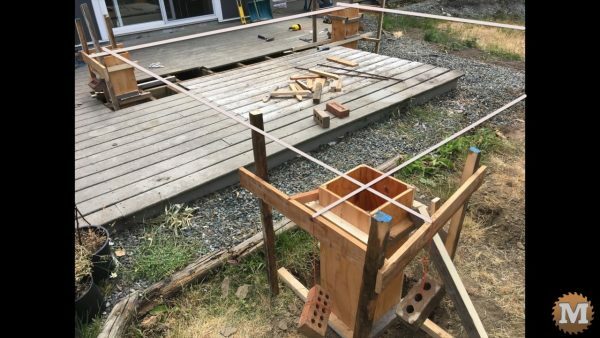 Countersunk holes are drilled in so a long lag bolt can secure the four beams to the posts. 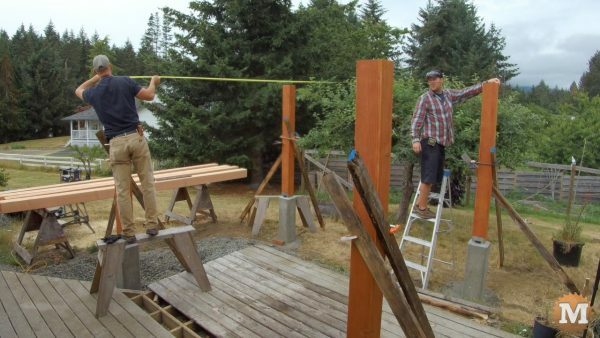 Measurements are double checked, then these beams are laid out. 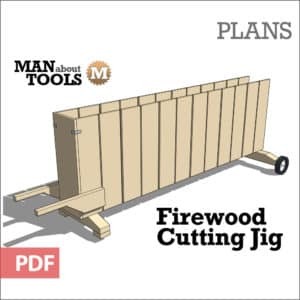 They are cut to length and the grooves cut as before. 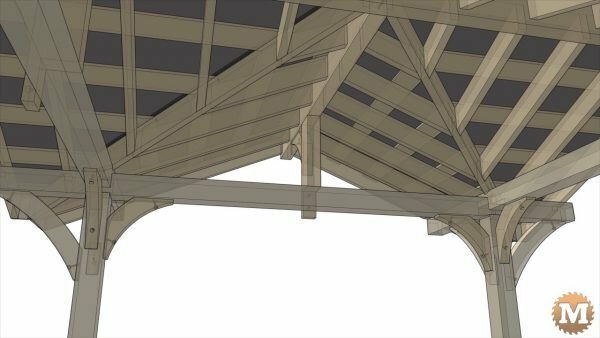 The East ends are chamfered in the same manner as the other beams. The first beam is brought up and laid over the two North/South beams. Then it’s slid over and into place. My end didn’t fit so we lifted it back out. I grabbed a taller ladder and circular saw and opened the groove up a bit. Then this beam fell in nicely. 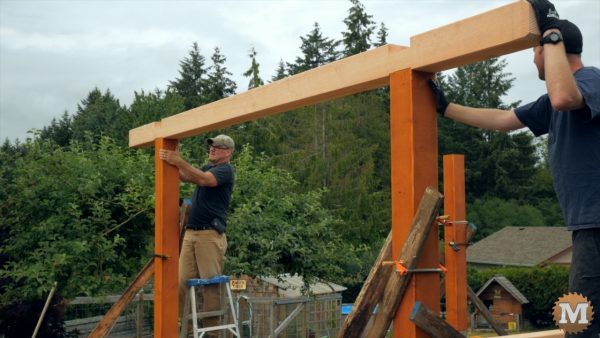 We lifted the last beam and laid it across the frame then slid it over and dropped it into place. And that’s the end of a very satisfying day. 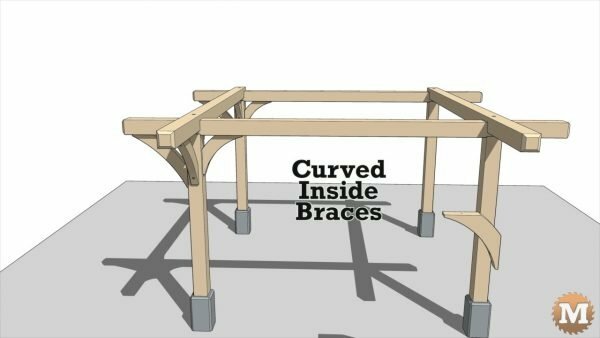 For this structure I designed two similar braces. For the inside corners I have a small curved brace. These are made from 3″ thick stock. Connor’s neighbour, BJ, was kind enough to let us use his shop to make the braces. Beforehand, I made two plywood patterns for the brace designs. 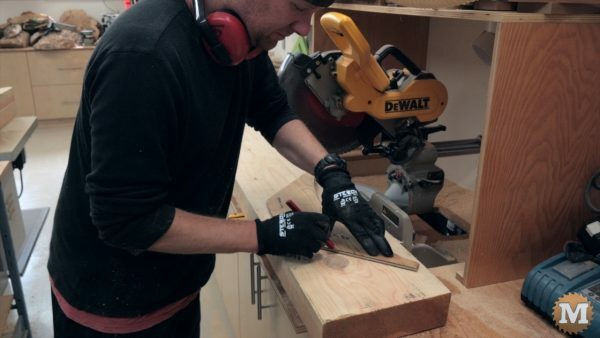 Here Connor is tracing the outline of the smaller brace onto stock. And trying to avoid any knots if he can. 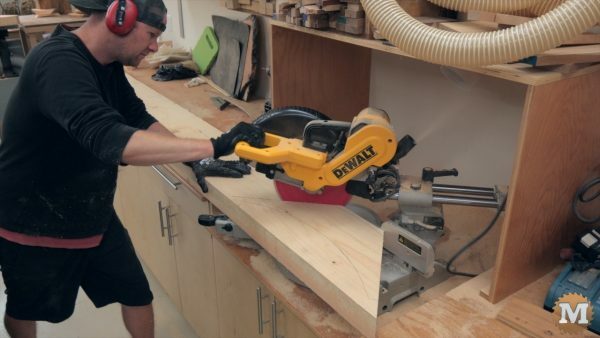 He cuts two opposing 45 degree angles on the miter saw. 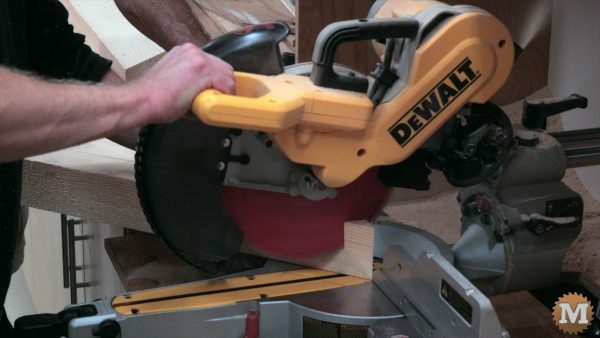 Finishing each cut with a hand saw where the circular blade didn’t reach. I took these to the band saw to cut the curves. Then over to the sander to smooth the rough spots. The outside braces are slightly larger. As before, the pattern is traced and the angles cut. There’s a small 90 degree cut in the corner, and that’s done on the miter saw as well. These too are taken to the bandsaw to cut the curves then on to the sander for finishing. 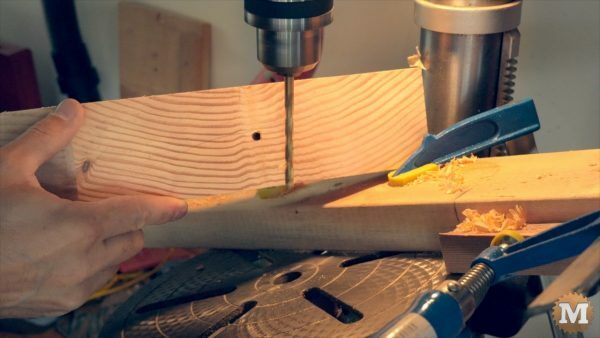 Stops are clamped to the drill press table and it’s tilted 20 degrees. 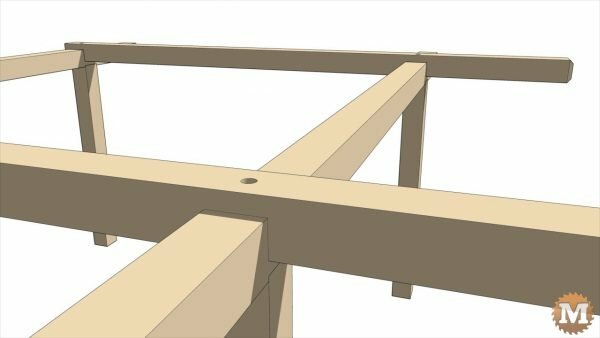 A forstner bit is used first to countersink the head of the lag bolt that will secure the brace to the posts and beams. Then the bit is swapped out, and holes drilled clean through the brace. After staining, the braces are held in place and holes drilled with a long bit into the beam, then into the post. 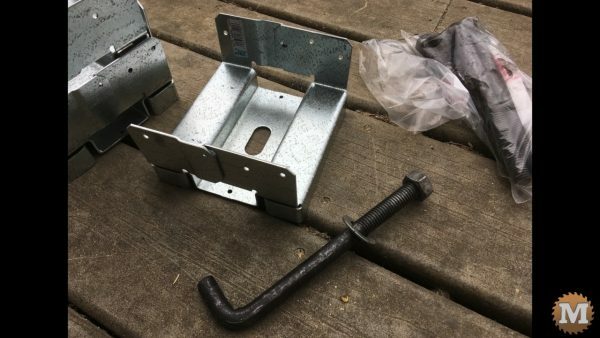 Long galvanized lag bolts are run in with an impact driver. Then hand tightened with a socket wrench to prevent thread rip out. 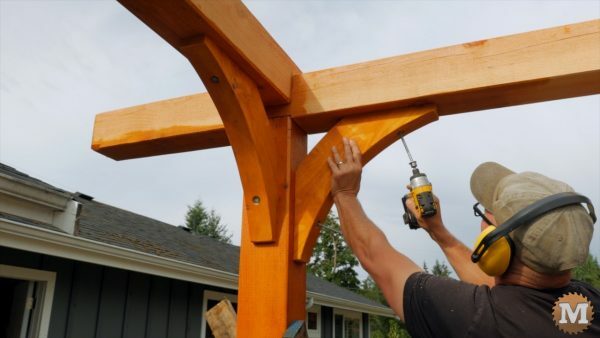 The larger outside braces are easier to install with some help. 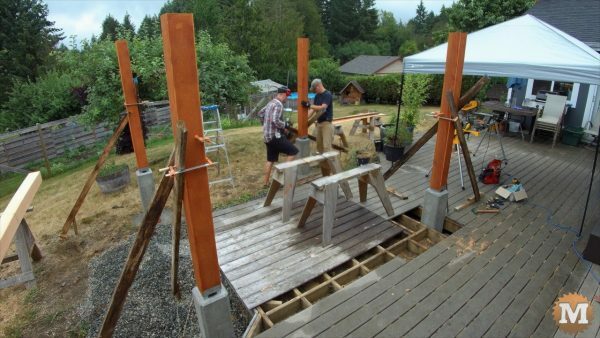 Next we make the king posts and attach them to the beams with lag bolts. 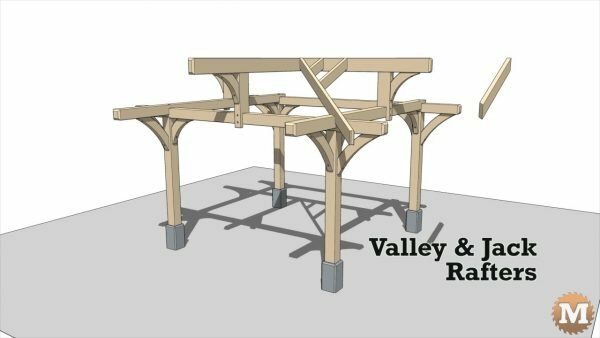 The North/South ridge beam is brought up and laid across the East/West beams. 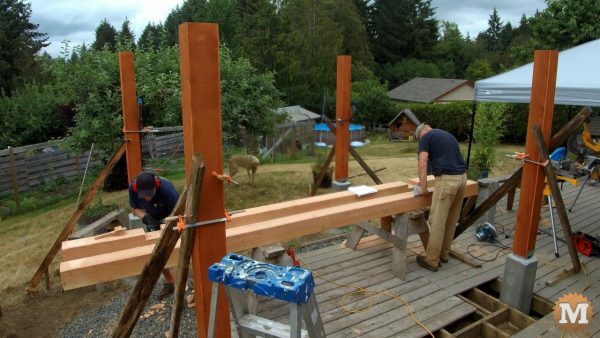 The last two king posts are secured then the ridge beam is lifted into place. Then a small corner brace is added between the king post and ridge beam. 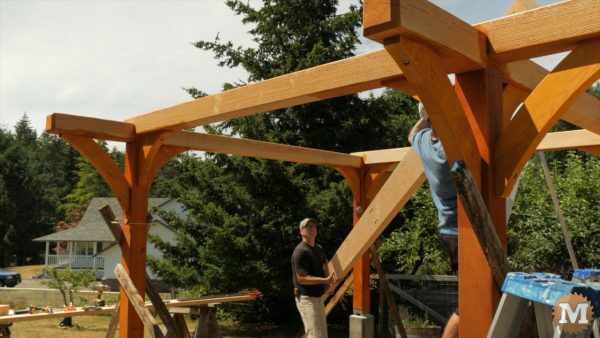 Four rafters for the South and North gable ends will be installed. 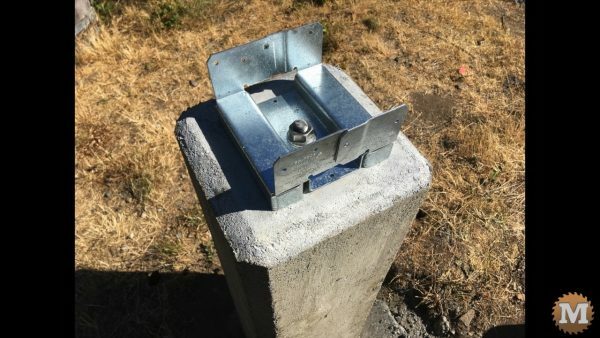 I put these in place now to help secure the ridge beam so it won’t move laterally when the next ridge beam is installed. 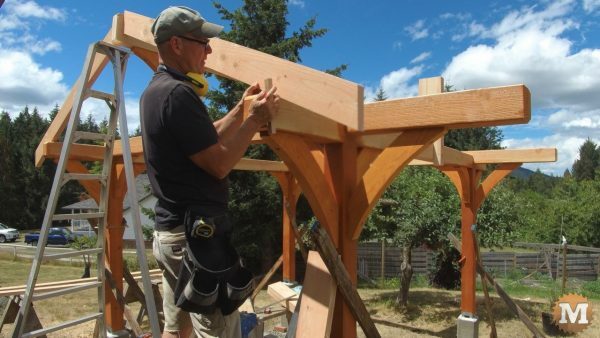 These rafters are cut to length and have plumb cuts on both ends. 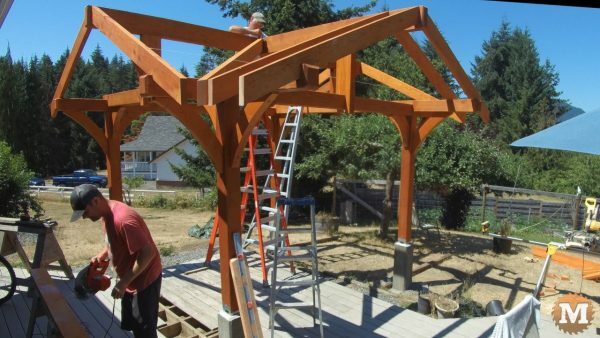 They are then positioned against the ridge beam and laid over the North/South beams to mark the birds mouth cuts. They are secured to the beams with screws. The king post on the East facing gable end needed some adjustment to ensure it was plumb and square before the next ridge beam was placed. The shorter East/West ridge beam is hauled up and bolted into place. 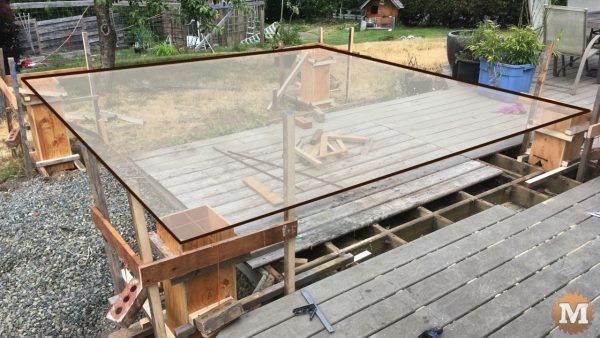 Connor then stained the rest of the frame. Next the valley rafters are cut. They have plumb cuts in either end and ideally a V groove cut in the lower end for fascia boards. 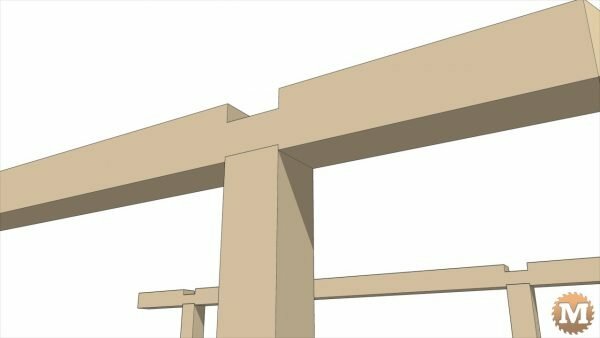 Then an angled birds mouth where it sits over the intersection of the beams. 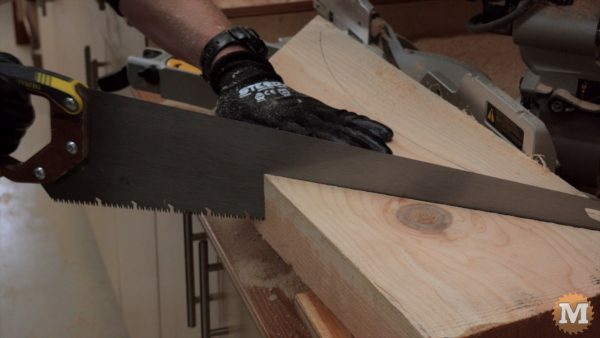 And 45 degree angles cut in the upper end where it sits in the corner of the two ridge beams. Four rafters are installed on the East facing gable end. 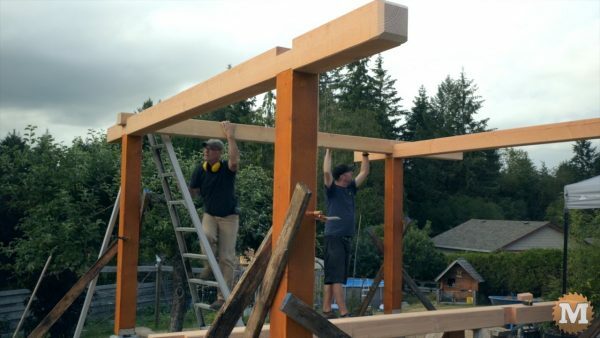 Like the other gable ends, it’s done first to stiffen the structure before the next steps. 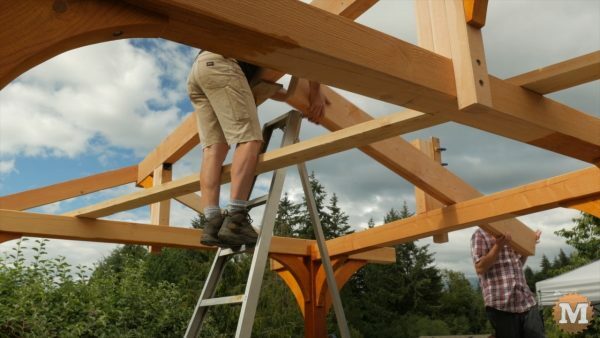 Valley rafters are tricky and I have one chance to get them to fit right. So I took my time. I ended up hauling them up and down quite a few times before they were done and screwed into place. 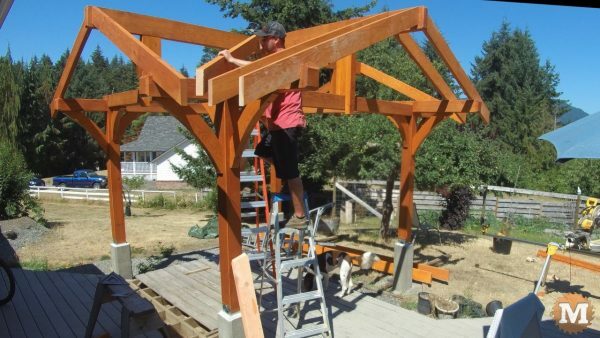 Connor installed the common rafters across the West end of the pavilion at the same time. With the valley rafters in place we called it a day. 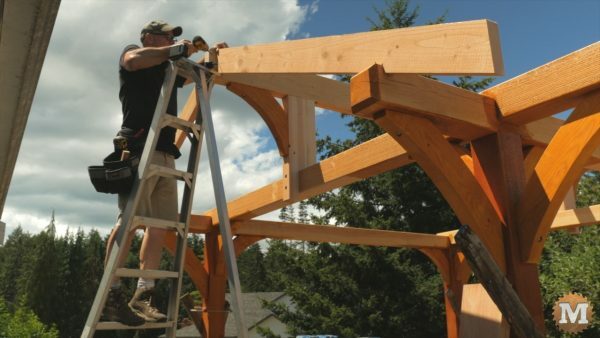 Connecting the ridge beams to the valley are jack rafters. 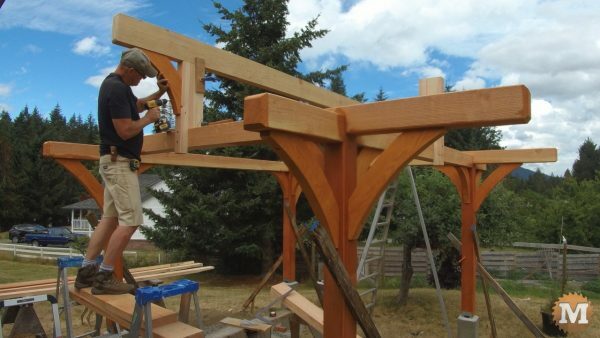 The ends are plumb cut square to their face where they connect to the ridge beams. 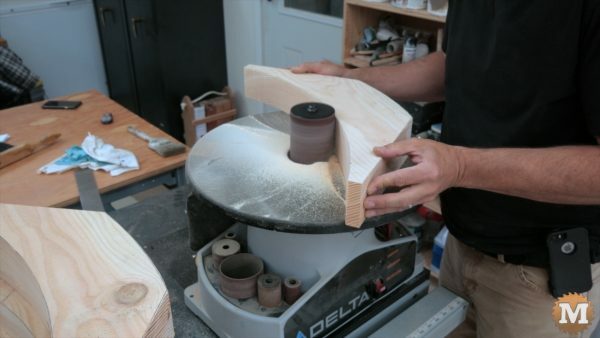 Then a plumb cut at a 45 degree angle where it mates with the valley rafter. And that’s the principle framing done. Connor worked on his own to add fascia boards and all the roof strapping. 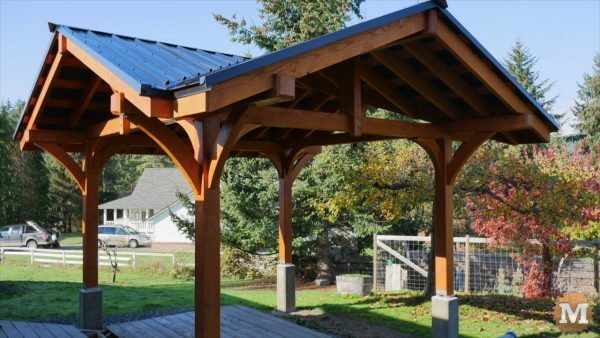 Initially we planned to roll out tar paper over the strapping before adding the metal roof. Connor decided to use plywood instead. He painted it flat black first before installing it and I think it looks great. It adds a nice contrast against the stained fir. I came back to help finish the metal roof and add the trim. Later Connor plans to extend the deck to the North.